It's important to get your regulators serviced as per the manufacturers recommended service dates. When we service your regulator, a pre-service inspection and testing report will be carried out before disassembling, degreasing, cleaning, rinsing and drying. Our technicians have over 30 years experience in the diving industry and are trained and certified engineers by trade so you know your kit is in very safe hands. All parts are reassembled using only genuine manufacturer replacement parts and service kits, this includes all hose O-rings, the SPG swivel with new O-rings and oxygen compatible lubricant is used throughout. All parts are inspected methodically to identify any that are worn or broken, and both the 1st stage and 2nd stages are set to manufacturer’s settings and tested, before final assembly. We recommend that you have your gear serviced well before you intend on using it for that important dive trip and that you minimally try dive it before you go in a pool. Regulators in particular can settle and may require a final tweak in adjustment to achieve optimal performance. All serviced equipment is normally available for return to the customer within 5-7 working days, however this time may increase if parts are unavailable or if demand for servicing is high during peak seasonal periods, ask us if timescales are important to you. We charge a fixed labour rate for our servicing, plus the cost of the service kit. 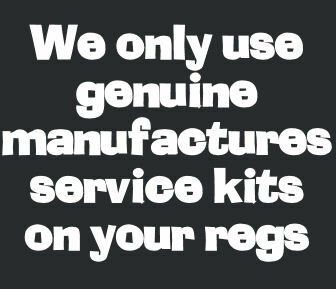 Service kits from manufactures can vary widely so contact us for a quote on your particular regs. If you've got a quote elsewhere, give us a call first as we offer very competitive rates and can offer bulk discounts! The quoted price for regulator servicing covers labour cost only! Brand specific service kits or any replacement parts required are an additional cost. Most standard service kits (excluding Poseidon) are between £40 - £60 making the average service somewhere between £75 - £85. We offer group discounts on multiple items for clubs or schools and can collect and drop off your gear as well!